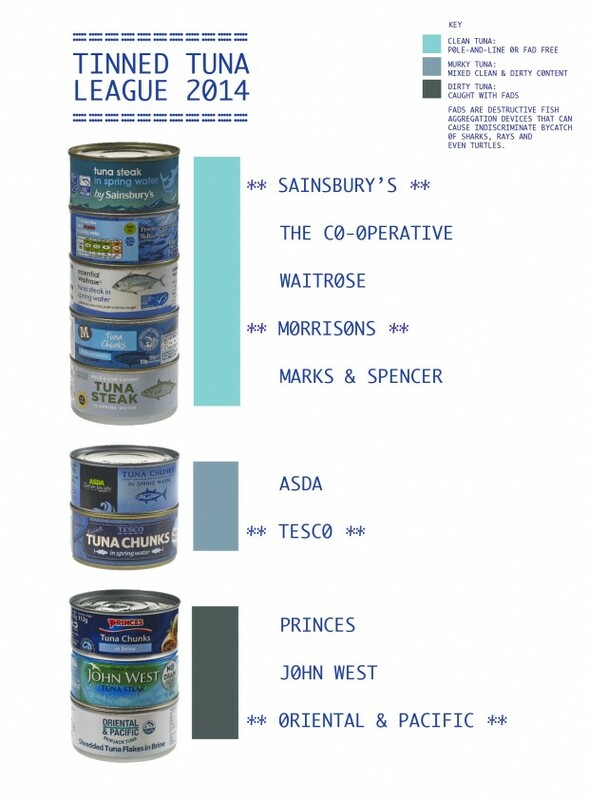 The new Greenpeace tinned tuna league table exposes the wide gulf between UK supermarkets and brands which have taken sustainability seriously and those which have simply broken promises to clean up. Use this to help you decide which brands to buy and which to avoid until they improve. The UK’s biggest tuna brand, John West, has come rock bottom, with the next biggest brand Princes not far behind. Following intense campaigning and consumer pressure in 2011 on these brands to end the use of destructive fishing methods, shockingly scant progress has been made. Coming last, despite doing well in some areas, John West crashes on sustainability. John West’s tins contain just 2% sustainable tuna despite promising to be at 100% by 2016 – clearly now a pipe dream. This means a whopping 98% of their tuna on supermarket shelves has been caught using destructive fishing methods. Big nets set around so-called Fish Aggregating Devices (FADs) are death traps for marine life. They accidently ensnare a huge variety of wildlife such as sharks and endangered turtles: not #JustTuna. These creatures are often dumped back into the ocean dead. Princes is also in the red for missing its original 2014 deadline to clean up its tins and eliminate FADs. Tins are only about a quarter pole-and-line caught tuna, which means 75% is still sourced using fishing methods that harm marine life. Finally, newcomer Lidl enters the ranking for the first time near the bottom of the ranking because nearly 80% of its own brand ‘NiXe’ tinned tuna is caught unsustainably in nets with FADs. It should adopt a commitment to stop using this method. For their exceptional efforts to provide customers with sustainable and ethical tuna, huge kudos goes to Waitrose, Marks & Spencer and Sainsbury’s for providing a market leading product. These three supermarkets have consistently topped our tinned tuna rankings over the years and continue to find ways to improve. All are go to #JustTuna brands which you should support. Also making it into the green for the first time is Tesco, because of its greater efforts to provide customers with more sustainable tins. Aldi is a newcomer to the league table, alongside Lidl, but has far outperformed its budget rival: meeting its commitment to source only sustainable tuna a full year early. Well done Aldi! In the middle of the ranking are Asda, Morrisons and the Co-operative which do all source their own brand tuna using sustainable methods, which is excellent, but they can and should do more to beef up and formalise other areas important to making sure they’re providing a truly sustainable and ethical product. Independent brands such as Reelfish and Fish4ever source 100% sustainable tuna and are great ethical #JustTuna brands. You’ll find Reelfish in Waitrose and Fish4ever in Ocado, Planet Organic, Whole Foods amongst others. It’s undeniable that the UK is leaps ahead of many other countries when it comes to the sustainability of tuna offered to customers by the UKs major supermarkets. We’ve only reached this point because of our collective campaigning; customer pressure off the back of Greenpeace campaigns and the Fish Fight programmes led by Hugh Fearnley-Whittingstall have transformed things for the better. This work has been described by The Independent as one of the most successful environmental campaign in years. And it’s vital that it stays that way because other countries and companies around the world look to what’s happening here. But all this is in danger of unravelling because of the poor progress made by the biggest tuna brands John West and Princes. This is undermining all the good work made by supermarkets and is dragging the UK market down. It’s time for us to collectively demand that John West and Princes clean up once and for all. 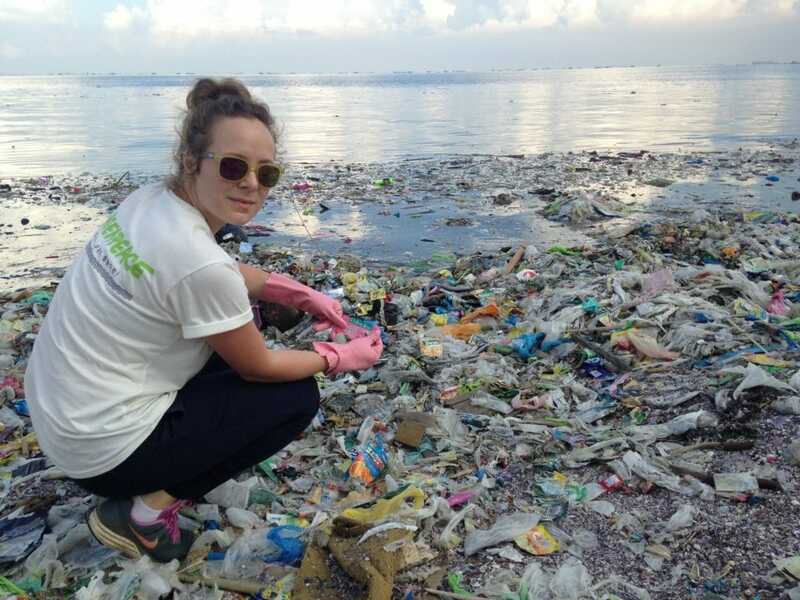 Because customers and the oceans deserve better. They deserve #JustTuna.